Williams Lift Company specializes in stairlift repairs, and are capable of repairing all Bruno and Acorn stairlifts whether they were purchased from us or not. If you have a chairlift in need of repair, located in the North Jersey area, contact us today for our stairlift repairs service. Our stairlift repairs service isn’t just limited to North Jersey. We provide temporary ramp and stairlift repairs and installation services to residents in Central Jersey as well. When people are in need of a company that can repair their chair lifts and other handicap equipment, Williams Lift Company is proud to answer the call! Customer satisfaction is always on our mind, which is why we are dedicated to giving every customer a wonderful experience. Offering prompt stairlift repair and installation services in NJ, we usually can arrive to your home within 24-48 hours to repair the lift. There is no need to wait around for days to have your lift repaired, so contact Williams Lift Company and get what you need repaired quickly. Our trucks are fully stocked with repair parts for most models so your lift can repaired on the spot. Whether we are repairing a temporary ramp, stairlift, or vertical platform lift in North Jersey, we will have the tools needed for any job. Our wonderful service doesn’t stop there. Here at Williams we pride ourselves on service after the sale. If you purchased your stairlift from us, you have priority servicing, which guarantees same day or next day repair. 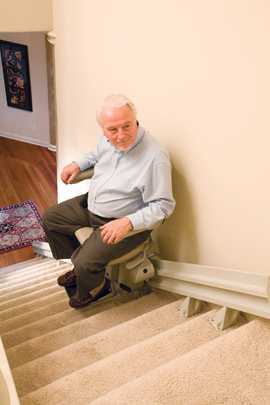 Call us now for stairlift repairs!